First, there is a farmer’s market every Thursday right outside my office, which I go to most Thursdays to browse. Yesterday the Toyota Farm to Table Tour happened to actually be at the market, so my friend Kara and I ventured out in the afternoon to check it out. The whole concept is that they travel around to different farmers markets around the US to show the connection between local chefs and the local food they use. Very reputable chefs from around DC were there, including this guy. I also got to eat a Vietnamese Summer Roll with fresh ingredients from the Farmer’s Market. And I was actually pretty thankful that I don’t eat meat because it made it a lot easier to not overdo it. The quesadillas, taquitos, and chicken wings (obv) all had meat in them, so I stuck with some calamari, mussels, and spinach artichoke dip. I also ordered hummus and pita later, but didn’t feel like I overdid it at all (with the food, that is). I did possibly have a few too many drinks but it was fun and I rarely go out drinking. That’s Kara and me at the bar, her with a blueberry martini ($4!) and me with my go-to vodka soda with a lime. Don’t mind my greasy face – – clearly I needed some face powder! This morning I woke up feeling surprisingly great and feeling well rested. I was asleep before 11 and until after 7, so I got over 8 solid hours and felt quite refreshed. I wanted the same breakfast that I had yesterday, but I had frozen the other half of the banana. So, I decided to just microwave it and mash it and it worked out great! 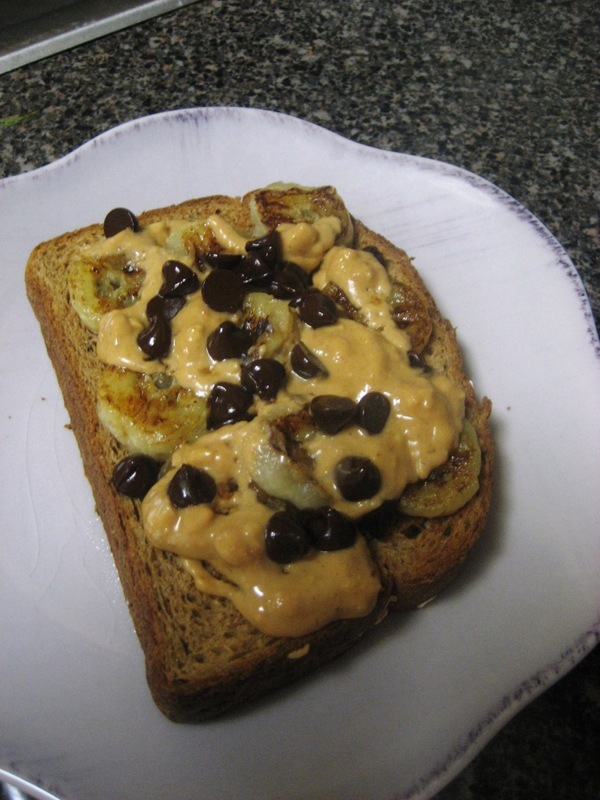 Whole Wheat Toast (1 pt) with 1/2 large banana, mashed (1 pt), 1 tbsp chocolate chips (1 pt) and 1 tsp of peanut butter (1 pt), so only 4 points this time. The key is throwing it back into the microwave for 20-30 seconds once its assembled because everything gets gooey and melts together. After snapping that photo I used a fork to mix everything together so the whole thing was chocolate peanut buttery goodness. Have you ever met anyone famous? Who, where and how? I have more good news about that delicious Open Faced Chocolate Peanut Butter Banana Sammie from this morning.. it kept me full for HOURS. I was kind of surprised since I only used one slice of bread but after 1pm I hadn’t eaten yet and I wasn’t even feeling very hungry until I thought about it which was 4.5 hours after breakfast. Score! When it was time to eat, I toasted the corn tortillas to get them warm and a little crispy, while microwaving the black beans and corn. Once the tortillas were done, I split the mixed greens between the three tortillas, then topped them with the black bean and corn mix, and then added the babybel cheese on top. I nuked the whole thing for about 20-30 seconds to get the cheese a little more melty. This was such an awesome lunch for only 6 points! It seriously took less than 5 minutes to throw together this morning too, which is always a plus in my book. I feel like if I got something similar to this in a restaurant it would be just as good but at least double the points/calories. The only thing I might have changed is added some avocado to the tortillas, but I didn’t have any and these were delicious without. I went to Weight Watchers today for the first time since July 8th. I missed the 15th because I was in Minneapolis and was too busy to make it last week, so this was my first time back in 3 weeks. The results? I went back for the first time since April on June 24th and I have lost 5 pounds since then! (2.6 pounds on July 8th, and 2.4 pounds today. This is a lot for me since the scale hasn’t budged in so long, and I think a lot of it has to do with the fact that I worked out 6 times this week! I’ve also been trying to plan my meals a little better, eat out less and eat a lot more fruit and veggies. I am sooooo happy because now I only have 4 pounds to go!! I set my official weight goal with my leader today, and while my personal goal is a bit lower, I’m much more concerned with getting to my WW goal so that I can make lifetime and stop paying. I’ve been going since March 2009 (minus a few months here and there) and am finally getting so close to my goal that I can taste it. Originally I wanted to be at my goal by my best friend’s wedding next Saturday, but I realize that’s not reasonable and just want to be able to stick with it and hopefully be to my goal weight by Labor Day. Is anyone up for a Labor Day Challenge??? There are 5 more Thursdays before Labor Day, so if you are interested, leave a comment saying what your goal is, and it doesn’t have to be weight related at all. It can involve working out a certain number of times a week, getting in a certain number of fruit and veggies, appreciating your body every day.. anything!! I’ll do a Labor Day Goal check-in every Thursday for the next 5 weeks so we can all update each other on our progress. My goal is to get to my goal weight by Labor Day. That means losing an average of .8 pounds every week from now until then. While I won’t CRY if I don’t reach it, I hope this challenge can keep me on track to at least make heavy progress towards this goal!! Happy Hump Day! Sorry I didn’t come back yesterday… I had an extremely busy day at work and it got away from me! For lunch yesterday I had brought another Roasted Red Pepper and Chickpea Burger, but in my hustle out the door in the morning I forgot a bun or bread of any sort. I realized there was an italian bakery at Potenza right near my office, so I ventured over there around lunch time in search of some bread. I was a little taken aback by all the food there! I forgot my camera because I was just planning on picking up a roll of some sort, but it was the cutest little Italian Bakery ever. They had tons of fresh made sandwiches, soups, breads, foccacia, quiches, frittatas, etc, so when I saw the Ribollita Toscana on the menu, described as “Tuscan vegetable soup, black leaf kale, leeks, bartolotti beans, and croutons” I changed gears and ordered the soup instead. It came with a ciabatta roll and was deeeeeelicious. 5 points for the ciabatta roll, and 1 for the soup. I also picked up a humongous grapefruit for 75 cents which I ate as a snack later. I also ate the burger, which I made with feta instead of parmesan for a snack in the afternoon (sans bread). This one had just 1.5 points, with 1/4 cup chickpeas, 1/2 a roasted red pepper, handful of spinach, 3 basil leaves, and 1 oz of RF Feta. It was a little loose so next time I would use some parmesan too because that gave it the perfect consistency, but this worked well to eat with a fork. I ventured to Whole Foods after work because I was out of a lot of staples (bananas, bread, milk, eggs) and obviously ended up getting much more than what I needed, but everything together was $40. These were a sample from the same company that made those awesome crackers that I got at Costco last week. These things are sooo good, almost too good. You get 35 in a serving (!!!) which has 2 points. 4 servings in the bag, about 3 of which I ended up eating because they were that good… dangerous. I have 3 more flavors of these to try and I think I’m going to break them up into servings when I’m not hungry so that doesn’t happen again. I also had 2 tablespoons of peanut butter and a very small bowl of soup since I was snacked out by the time it was ready. The first part of the run was really, really good, but towards the end I started getting really hungry/famished. I knew that it was because I hadn’t had a good, solid meal last night, so I just kept telling myself it would take longer to get home if I stopped and walked and that got me through the 3 miles. SO good. I haven’t had oats in a jar in agggessss. too long. The worst part of this was when it was over. I’m still mourning a bit. Do you buy organic or non organic produce mostly or how do you tackle that issue? In an ideal world I would love to buy all organic but my wallet just doesn’t go for it. I try to shop the sales a lot, and going to places like Trader Joe’s for apples where they charge by the apple, not by weight, makes it easier to buy organic. I try to buy organic for things where you eat the skin/whole fruit (grapes, apples) and don’t mind as much with things that you remove the skin (bananas). But, if I want apples and no organic apples are on sale and its 2$ more per pound, I’ll usually buy the non-organic ones. I was pleasantly surprised when I opened the box and there were four squares of tofu inside rather than one huge chunk like most packages have! Each of these squares is 2 Weight Watchers points, so a great portion to cook for one (which is almost always the case when I’m making Tofu). I’ve had the tofu twice since opening the box, once on Saturday night after my race and once today for lunch. Saturday night my boyfriend grilled me a piece of tofu while he and the girls had steaks. He served it with mashed sweet potatoes and green beans. Check out these grill marks! That smear is of the ginger dressing (also from Costco) that I marinated the tofu in. I’d never had grilled tofu before, and this was awesome. Grilling it gave it a really nice texture, plus it was pretty to look at. Lunch today took just a few minutes to prepare. I diced up the block of tofu (2 pts) into 9-1″ squares and rolled the tofu in Italian Herb Garlic Gold (0 pts), and then pan seared it for a few minutes to sear the flavor into the tofu. I served it over the leftover Fajita veggies (1 pt) from yesterday. I also had a Ceasar salad with this bowl, which had romaine, 1 tbsp of shredded parmesan (1 pt), 1 serving of organic wheat croutons (1 pt), and 1 tbsp of light ceasar dressing (1 pt). Which is really delicious. It’s 80 calories and 7grams of fat for a 2 tbsp serving, which is much lighter than most Ceasar dressings. It’s still very creamy and decadent tasting, so perfect when you’re craving Ceasar. I also had an apple for a snack before lunch, so today’s total is 4 (breakfast) + 1 (snack) + 6 (lunch). I’m trying to be really good about being back to counting points but I feel like a broken record. I am good for a few days then totally off track and just so back and forth. So instead of preaching and saying what I’m going to do, I’m just going to show you. I plan to go back to WW on Thursday since I haven’t weighed in in a few weeks and I really need to lose the last 6.4 pounds +/-! Yesterday afternoon was so hot (but not as hot as today!) so I went to Starbucks and got myself a little treat. Two glasses of wine and one mojito later, it was time to go home and to bed! This morning I woke up and could not believe how hot it already was outside at 9am! There were tons of people at the pool but I honestly didn’t want to even go outside because the heat was intense… plus I had a 5k tonight and wanted to run in it if possible, so I knew staying out of the heat during the day was in my best interest. 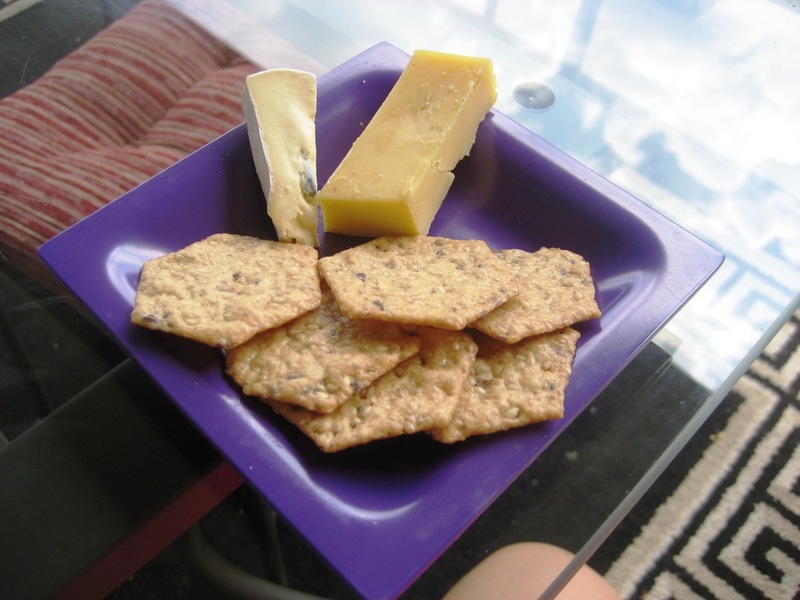 Two small pieces of cheese leftover from Thursday night and 1/2 a serving of those crackers from Costco. Wil ended up whipping up a rustic fish and veggie soup for lunch. It had some mahi mahi, salmon, and shrimp, all leftovers that we froze from different times making dinner. Plus there was corn, zucchini, and yellow squash from our farmshare, and carrots, onions, and basil. And a piece of wheat toast sliced up for dipping. The soup was delicious, especially after I added some sriracha, but maybe wasn’t the best idea for a hot day like today (don’t tell him I said that ;)). I kept trying to talk myself into thinking the race was a good idea all day despite the heat. Nora and Charlotte were really excited to come watch, which made me feel a lot more into the idea, so around 7:30 I got dressed and headed down to the race area. I was shocked with how many people there were running the race! Can you spot me? They did and came down to get a closer look of me behind the start line. My first mile was a 9:00min pace, then 9:39, then 10:34. I saw Wil, Nora, and Charlotte towards the 3 mile mark which gave me the final pep to sprint the last tenth of a mile, which was at a 9:27 minute pace. I’ll update my final time once I get the official race time, but it was tough. I could not tell you how happy I was to cross the finish line! !